Step 1: Click on the left and right buttons next to the title that says stake to place your first bet on Bar X Magic 7 slots. Step 3: To begin play, click on the purple start button, or click auto bet if you wish to place additional bets of the same value stake after each spin has expired. The Bar X Magic 7 slots machine is just exactly that. A slots machine. 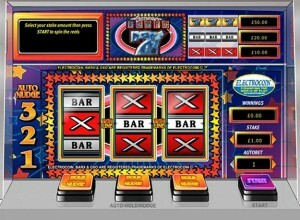 It has been designed to look like the typical slot machine you might find in an UK arcade or gambling house, complete with excellently chosen colours, and nudge buttons, making this slot game as realistic as possible. One troublesome aspect of the game is an auto nudge function, which sometimes takes control of nudging a line to possibly turn it into a winning one, though this for amateur gamers in very confusing, and it isn't clear exactly when and why the Bar X Magic 7 slots game decides to do this. 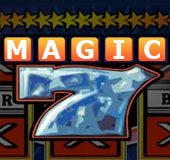 The symbols on the three reels in Bar X Magic 7 slots consists of bars, sevens and X's as the title would suggest, there are no bonus rounds to trouble gamers though, which is unfortunate. As great looking and stylishly designed as this real to life online slot game is, there is an element of disappointment that it perhaps is just a tad bit too primitive.